Die within a die to create "double" the pleasures of rolling this one. An interesting set of double six sided dice, dice inside of dice. Each of these is a transparent six sided die with another opaque six sided die inside of it. 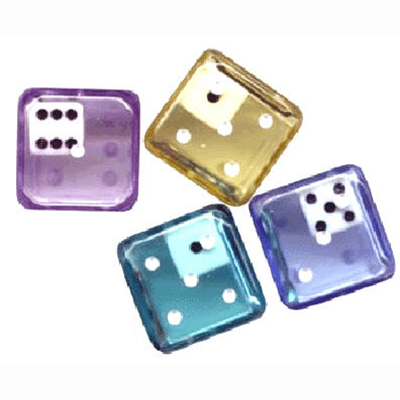 On all six dice, the outer 19mm die is transparent with white spots etched in to the surface and the inner 8mm die is opaque white with black spots etched in to the surface. Note: Colors vary, they are picked upon availability.